Injured in a motorcycle accident? It is clear that motorcyclist are at a much higher risk of permanent catastrophic injuries or death than people traveling in automobiles, trucks, minivans, or SUVs. Without the protection of an automobile, traumatic brain injury, spinal injuries, fractured bones, herniated discs, joint injuries, abrasions, contusions, sprains, and strains, and other injuries are going to happen. Serious injuries or death result in huge medical expenses, lost wages, and pain and suffering so it is critical that you hire an experienced motorcycle accident to protect you and your family from financial ruin. The Griffin Law Firm can help. Attorney Richard Griffin and his motorcycle accident attorneys know how to handle motorcycle accident claims. The insurance companies jump into action to investigate the motorcycle accident. Their mission is to build the defense to your personal injury claim. Without legal representation, the insurance company will win. We are here to even the playing field and to fight for your to make sure you are fully compensated for your personal injury or wrongful death claim. What will we do to help you with your motorcycle accident personal injury claim? Immediate Investigation: The Griffin Law Firm will immediately investigate the motorcycle accident. This investigation includes obtaining the police report, getting the recorded statements from the witnesses, photographing the accident scene and injuries, handling all correspondence and phone conversations with the insurance companies, and other important tasks. Insurance Coverage Notification and Verification: It is very important to send proper notice to all of the insurance companies that cover your motorcycle accident claim. If you fail to send proper notice, then many insurance policies can lose their coverage for your claim. It is also important to allow our motorcycle accident lawyers to verify all of the insurance policy limits. If you don’t know the actual policy limits, then you may lose your ability to stack your uninsured or under-insured motorist policies for failure to exhaust the underlying liability coverage. Medical Treatment: The Griffin Law Firm can be extremely helpful in helping you get the medical treatment you need. We can help you select the best doctors from your health insurance plans if you have health insurance coverage. If you don’t have health insurance, then we can help you get the medical treatment you need through the use of doctor liens and medical funding companies. Either way, selecting the right doctor is the only way to make sure you will fully recover from your physical injuries and to make sure you will be fully compensated for your motorcycle accident personal injury claim. The adjuster hopes you will delay getting the medical treatment you need or limit the treatment because you don’t have the money. We are here to make sure this doesn’t happen to you. Lost Wages: The adjuster often will attempt to arbitrarily reduce or deny your lost wage claim if you don’t have representation. Often the adjuster will say, “we don’t think you needed to miss that much time so we’re denying your lost wages.” The Griffin Law Firm will make sure that your lost wages are fully documented with Wage and Salary Verifications from your employer and with doctor excuses (disability certificates) from your treating doctors. Pain and Suffering: You are entitled to be compensated for your pain and suffering in addition to your medical expenses and lost wages. The adjuster will normally refuse to pay more than just a nominal amount for pain and suffering. However, attorney Richard Griffin and his motorcycle accident attorneys will assist you in establishing your pain and suffering by describing specific ways your life has been negatively impacted in our settlement negotiations. We also utilize before and after witnesses if litigation is required to further demonstrate to the jury why a substantial amount of money should be awarded for pain and suffering. Punitive Damages: If you were injured due to the actions of a drunk driver (DUI driver) or a hit and run driver, then we will also pursue punitive damages in your motorcycle accident personal injury claim. Punitive damages are the damages you can recover in Georgia when defendants behave in a way that demonstrates a reckless disregard for human life. Punitive damages often greatly increase the recovery in personal injury or wrongful death claims. 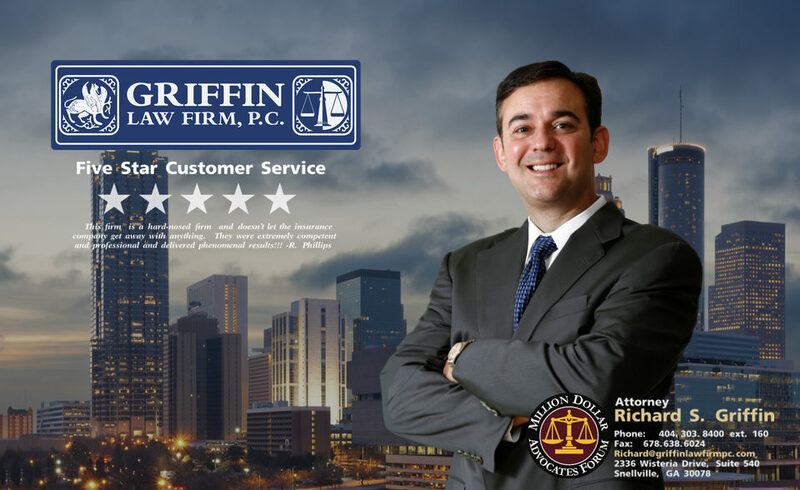 Great Recovery: The Griffin Law Firm will make sure you receive the great recovery that you need and deserve. Normally this can be accomplished through settlement negotiations, but if the adjuster does not negotiate in good faith, then we aggressively litigate your claim. Client Testimonials: Read the actual reviews from our real clients to see that our client’s love our representation and to find out why. Firm Awards: The Griffin Law Firm and attorney Richard Griffin have received many honors and awards from the legal community. We encourage you to read about these awards for yourself. Settlements and Verdicts: The Griffin Law Firm has a history of obtaining great recoveries for our clients. We recommend that you read more about these personal injury and workers’ compensation settlements for yourself. Motorcycle riders are 35 times more likely to be involved in an auto accident with fatalities than someone in a car. There are about 88,000 people injured in motorcycle accidents every year. There are about 4,800 motorcyclists killed in motorcycle accidents every year. About 11% of all auto accidents involve motorcycles. Traumatic head injuries are the most common cause of fatalities in motorcycle accidents. Motorcyclists without a helmet are 40% more likely to suffer a traumatic brain injury. Helmets reduce the motorcyclist’s risk of death by 37%. About 42% of the motorcycle accident fatalities involve an automobile turning left in front of the motorcyclist. Speeding is a factor in about 35% of the motorcycle accidents. Speeding without wearing a helmet doubles the risk of fatality. Free Motorcycle Accident Consultation: The information you will receive by calling the Griffin Law Firm is free, but the value of that information could be invaluable. Call us today at 877-529-7070 or 877-PAIN-LAW.